A few years ago the story of former Russian double agent Sergei Skripal allegedly being poisoned with a deadly nerve agent in the UK supposedly by the Russian state, would have shook geopolitics and placed immense pressure on Moscow. Today, while it certainly did shake geopolitics, it was more from the narrative hitting a brick wall than from its desired impact toward cornering the Kremlin. While the United Kingdom’s credibility unraveling played a major role in the UK’s own narrative failing, it has been the growing global alternative media that has exposed and diminished the true nature of British credibility in the first place. 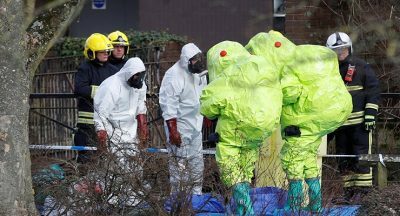 Analysts have linked the Skripal affair with a series of other Anglo-American geopolitical maneuvers including staged chemical attacks in Syria and the subsequent missile attack launched against the Syrian state. However, all of these pretexts failed to find their mark, leaving Western capitals increasingly exposed without the cover of legitimacy they have manufactured and enjoyed in the past. Russia’s own international media played a significant role in publicly informing global audiences of alternatives to the UK’s Skripal narrative, as well as challenging the UK directly. The growing influence of Russia’s international media helped provide balance to global discourse that was once solely dominated by US and European media organizations. Long gone are the days of clumsy Soviet state media. Russia’s modern media has performed an act of public relations judo, using the most effective techniques of the Western media, and directing them back against the West. When this involves some of the most dishonest and aggressive agendas driven by Western special interests, they resonate with a global public increasingly disillusioned by the Western media. For the time being, the global alternative media comprised of small independent media organizations and even individuals, have benefited from working with modern Russia media. Despite claims of “Russian influence” and “Russian propaganda,” it should be noted that citizens and organizations around the globe contributing to, being interviewed by and appearing on Russian media are no different than those appearing on American and European networks. Attempts to portray it as being somehow different is based on the assumption that Anglo-American and European media is in some way morally superior to that of other nations, yet this assumption in and of itself is predicated on decades, if not centuries of exceptionalism bred from quite immoral hegemony. Independent media organizations and individual journalists and analysts holding alternative views from the mainstream US-European media are systematically denied a platform to fairly air these views in the West. Contrary to the West’s supposed values of “free speech” and objectivity among a “free press,” the actions of the Western media promote anything but. As long as Russia’s media focuses on issues such as corrupt global corporations, global military aggression and other global issues barred from being discussed freely and honestly in the West, this partnership will continue to flourish. The UK’s attempts to frame Russia for a “nerve agent” attack on Sergei Skripal and his daughter on British soil and thus dishonestly drag the British nation into a wider confrontation with Russia threatened not only Moscow’s best interests, but those of the British public as well. While state media from Russia certainly helped counter the UK’s narrative regarding Skripal, thousands of independent media organizations and individuals around the globe also contributed. News personalities and analysts with large audiences across social media and video platforms like Twitter, Facebook and YouTube have grown into an increasingly important counterbalance to the Western corporate media. To illustrate how effective the alternative media has become, the Western media has intentionally and very dishonestly attempted to lump them in with Russian international media to undermine their credibility. While the truth behind the Skripal affair has yet to be fully revealed, with Sergei Skripal and his daughter having disappeared from public view and official mention, and while it is still not certain why exactly the British government fabricated this incident, it does appear linked to the likewise staged chemical attack in Douma, Syria. The Skripal affair may have been designed to undermine Russian credibility at the United Nations Security Council ahead of the staged Douma chemical attack. Had things worked according to plan, a much bolder and more muscular “international” response might have been organized by the US, forcing Russia to back down in Syria and even potentially move the Syrian government out from under its political and military protection. However, this did not happen, for a variety of reasons. The military balance in the Middle East may still favor the US and its allies, but it is an advantage that can only be exploited through a much wider conflict than is currently unfolding in Syria. It will be difficult for the US to create the right combination of provocations and manipulate public perception sufficiently to justify the scale of conflict required to move its agenda forward in Syria. The Skripal affair failed make its desired impact on public perception regarding Russia at the United Nations. Yet the US was prepared to move forward with staged provocations and then strikes on Syria anyway. It is always difficult to quantify how much public perception plays in decision making. Washington’s military might is not directly affected by public perception, but an unconvinced and unwilling public can indirectly and unpredictably undermine military operations. With this in mind, we can see why nations like Russia, China and Iran have developed their own international media organizations, clawing space for themselves across once Western-dominated global audiences. The impact of this may not have in and of itself stopped the “Skripal Effect,” but it certainly blunted it. With sound foreign policy composed of viable incentives and deterrents, Moscow was able to fully stop it. The Skripal affair is now being transformed into a scandal, with the British government having more to explain themselves than supposed Kremlin assassins of whom there is still no evidence. As Russia reaps the benefits of years of developing its own reach into the global public, other nations across the developing world should consider the merits of creating their own international media organizations aimed at providing their side of the story to global audiences and reflecting their own national interests. Currently, many nations throughout the developing world have corps of journalists trained and indoctrinated in the West. When they return to their home nations, their reporting reflects Western, not domestic interests. They often develop direct ties to the Western media and even Western embassies, which further compromises not only any genuine journalist integrity, but also their ability to at least represent the interests of local populations they deliver misinformation to. Nations like Russia and China which export technology and defense systems, could potentially export their successes regarding international media by assisting other nations in building up effective media organizations that truly reflect each respective nation’s interests. Unlike the US which funds media in targeted nations to simply serve as an echo chamber in support of the US-led international order, Russia and China would be giving the tools to other nations to defend their information space themselves. While the interests of these nations may not always overlap with Moscow or Beijing’s, they will also most certainly never overlap with Western hegemony, a fact that serves to confront a common grievance among a growing number of nations worldwide well beyond just Russia and China.